Today's chocolate, from CocoTutti (cocotutti.com), packaged up two of my favorite flavors to mix with dark chocolate: lavender and lemon. 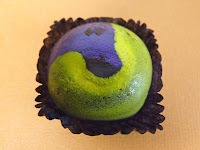 These two flavors suffused a very creamy and not overly sweet (thank you) ganache. The lemon and lavender, both strong flavors on their own, jockeyed slightly for position for a few seconds, but harmonized quickly. Unfortunately, some of the other chocolates in this assortment box were hit by a beam of direct sunlight coming from my skylight yesterday afternoon. So, I'll have to go back and get a replacement box to try all the other flavors I missed this time. Not a hardship.